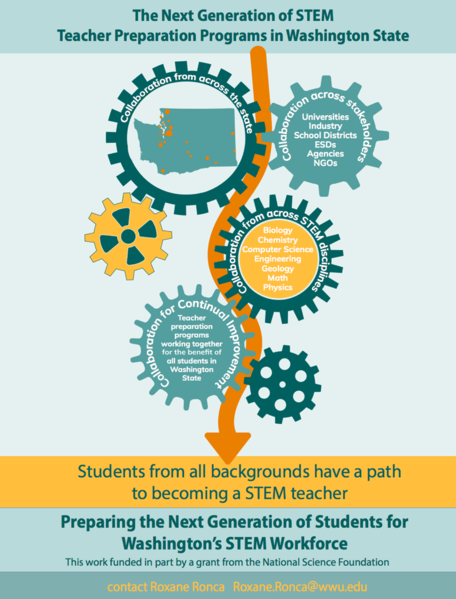 The Next Generation of Science, Technology, Engineering, and Mathematics (STEM) Teacher Preparation in Washington State (NextGen-WA) is an ambitious, multi-institutional collaboration to transform teacher preparation statewide. Creating the next generation of K12 STEM teachers. to improve how we prepare future teachers in Science, Technology, Engineering and Math (STEM) across the state. Institutions in this project prepare more than 90% of Washington's future STEM teachers. to create an adaptive, research-based model for improving STEM teacher preparation through collaboration. To achieve project goals and outcomes, the NextGen-WA consortium is focusing on three primary areas of effort: (1) building capacity for change at all participating institutions, with a focus on increasing the diversity of students pursuing STEM teaching, (2) innovation in six critical areas of STEM teacher preparation (Computer Science, Engineering, Math, Pedagogical Content Knowledge, Education for Sustainability, and the Clinical Practice experiences of pre-service teachers), and (3) evaluation of the impact of collaboration between diverse expert/stakeholder groups to support change within and across institutions. 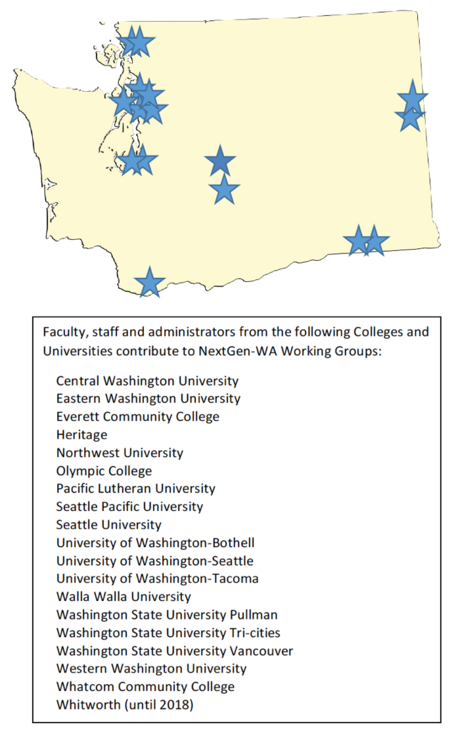 NextGen-WA consortium members participating in Working Groups and on Implementation Teams are the driving force behind this effort. Information on Working Groups and the Implementation Teams is linked on the left of this web page. an initial, tested model for improving STEM teacher preparation statewide through collaboration. How the project prepares the next generation of K12 STEM teachers. 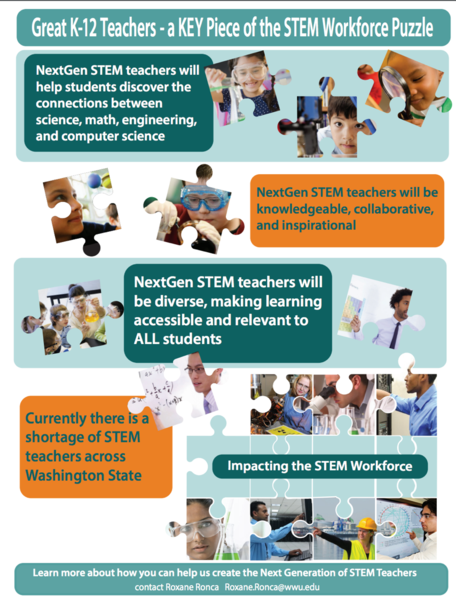 The NextGen-WA theory of change is that building strong, effective, collaborations among a diverse set of STEM education experts and practitioners will lead to more significant improvements in STEM teacher preparation programs than is possible when individuals and institutions work independently. Our theory is informed by Kania and Kramer's (2011) "collective impact" model for change, by improvement science research, by research on diversity and complexity, by research on professional relationships and professional learning communities (PLCs), and by research on systems thinking and leadership. More specifically, these studies suggest that to achieve large-scale (e.g. statewide) improvements in STEM teacher preparation, the NextGen-WA project will need to develop a common vision for change, build positive relationships between organizations and individuals, promote long-term commitments by a diverse set of professionals from higher education, P-12 education, government, business and non-governmental organizations (NGOs), and make regular and sustained progress towards shared goals using common metrics. A well-prepared STEM workforce starts with P-12 education. With Washington's adoption of the Next-Generation Science Standards (NGSS) and Common Core State Standards for Mathematics (CCSSM), Washington's science and math teachers must teach using rigorous standards and ambitious pedagogies that likely were not modeled in their own educational experiences. Teachers are now asked to draw upon deep content knowledge to elicit and understand students' ideas, and to develop pedagogical content knowledge that allows them to respond to and build upon students' naïve or emergent understandings. They must engage young people in science, engineering, and mathematical practices in authentic and culturally relevant ways, and to build students' (and their own) understanding of specific disciplinary knowledge and broad cross-cutting concepts. Therefore, in addition to these demands on preservice teachers, never has more been demanded from those in higher education who prepare future STEM teachers. STEM teacher preparation in Washington State faces several pressing challenges including: current teacher shortages in science and mathematics, strong demand for STEM majors and jobs, the need to align teacher preparation programs with new state math and science teacher competencies that reflect the NGSS and CCSSM, and the 2015 passage of House Bill 1813 which supports expansion of Computer Science classes across the state. In addition, there is need for greater coherence and collaboration across teacher preparation programs. Individual programs vary widely in size and type, and smaller programs often lack the capacity required to respond to national and state initiatives. They may also lack the personnel and resources to maintain active partnerships with stakeholders (e.g., other teacher education programs, state regulators, local school districts, NGOs, STEM professionals, etc.). 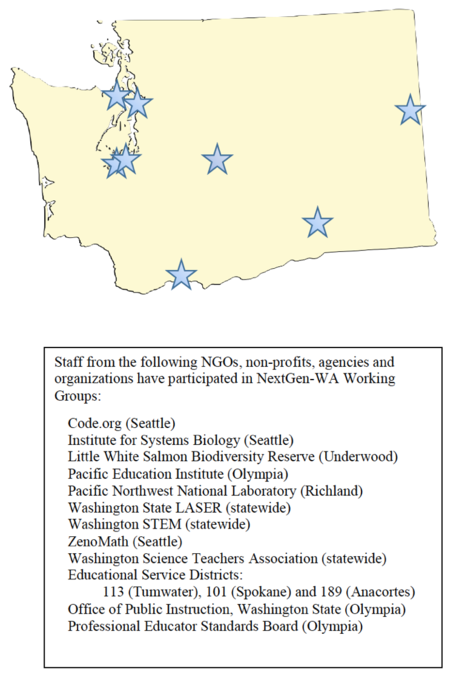 The NextGen-WA project addresses these challenges through collaborative inter-institutional Working Groups that allow individual members to share and create models, resources, strategies, and data with others; and, through institution-based Implementation Teams that work to incorporate these models, resources, strategies and data into their STEM teacher preparation programs. Information about these Working Groups and Implementation Teams are on the left of this page. This material is based upon work supported by the National Science Foundation's Division of Undergraduate Education under Grant No. 1625566. Any opinions, findings, and conclusions or recommendations expressed in this material are those of the author(s) and do not necessarily reflect the views of the National Science Foundation.